The great thing about paddle boarding is the versatility: you can do it wherever and whenever you like, whether out on the open ocean, on a lake, or even on a river. Paddleboards give you the freedom of surfing, but without the steep learning curve. You can kneel or stand on a paddle board and start having fun immediately. Paddle boarding has grown in popularity tremendously over the past few years. And with this growth in popularity, we’ve seen a whole host of new products come to market, promising paddle boarders a high-quality and fun experience. In this review, we’re going to take a look at the five of the best inflatable paddle boards – also known as inflatable SUPs – on the market so that you can decide which you want as your next rig. Ease of transportation is not the only benefit associated with using an inflatable option instead of a traditional solid board. Paddle boards are not small, which means storing a solid board requires a significant amount of space. Purchasing an inflatable one can be the perfect solution if you have limited room to keep one. In that case, the only question remaining is which stand up inflatable paddle board is going to be the best one for you? Here are 5 great options worth considering; find out all about them below. When Peak Expedition was designing their premium stand up paddle board, they had one thing in mind: exploration. The company markets its paddle board as a tool that people can use to explore their surroundings, no matter what the weather. Measuring over 32 inches in width, the board provides the kind of stability you need while paddling in choppy waters out at sea and on rapids, making water-based exploration relatively effortless and a whole lot more fun. 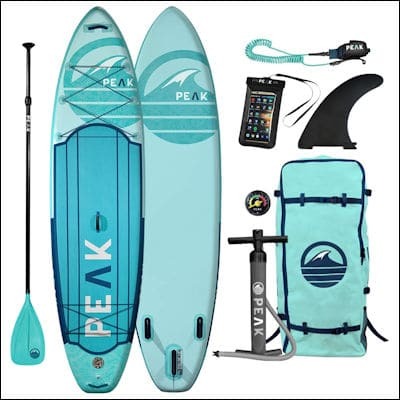 Peak Expedition’s product is targeting a new class of people who want the freedom to explore local bodies of water, but don’t want to go to the hassle of storing and transporting rigid paddle boards. Most people just don’t have space in their vehicles. Peak Expedition’s premium inflatable board rolls up into a neat package, and when stored correctly, doesn’t take up much more space than the average rucksack. Peak Expedition uses special reinforcing material technology to make the board more stable in the water, reducing the learning curve and enabling people to go out and have fun, as and when they want. The company includes a pump with the Peak Expedition, although you’ll probably want to use your own. The pump will do the job, but it’s a workout. A power-assisted pump with the correct attachment works a lot better. 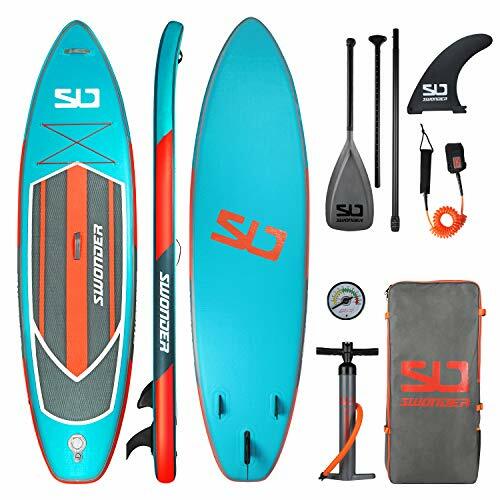 The Premium stand-up paddle board (SUP) needs to be pumped up to around 13 or 14 PSI to give the right under-foot feel which requires a lot of pumping because of the overall volume of the paddle board. Are there any downsides to Peak Expedition’s product? Not really. The paddle that comes supplied with the board can feel a little flimsy at times, but other than that, this is a well-built product with many helpful and useful features. SereneLife, like Peak Expedition, wanted to give their customers the freedom and flexibility to go out and enjoy the water, whenever they liked. Their Premium SUP is the culmination of their efforts – a paddle board which the company says is ultra light and will appeal to all skill levels. 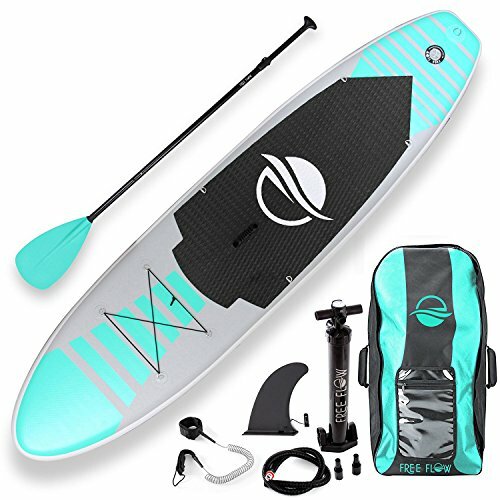 The paddle board features an extra-wide stabilizing deck, a non-slip top, and can be used on practically any body of water, including rivers. Many people have doubts about the durability of inflatable paddle boards because of the risk of puncture and deflation, but SereneLife has managed to get around this problem by including a ply system that can resist the scuffs and scrapes you’re likely to have out on open water. 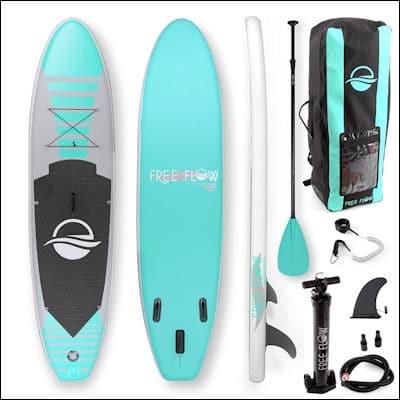 The material construction of the paddle board is indeed premium, and why this product comes in as more expensive than many of the others in this review. SereneLife claims that their paddle board is ultralight at 19.3 lbs, but this still comes in as heavier than many of the other boards on the market. The weight does not affect its handling characteristics in the water, but it does make dragging it to and from the car more of a challenge. Like the Peak Expedition, the SereneLife Premium SUP comes with a pump. However, as before, it is an effort to inflate the board, which may make some people feel exhausted, even before getting out onto open water. It should be noted that this paddle board is exceptionally thick and sturdy. 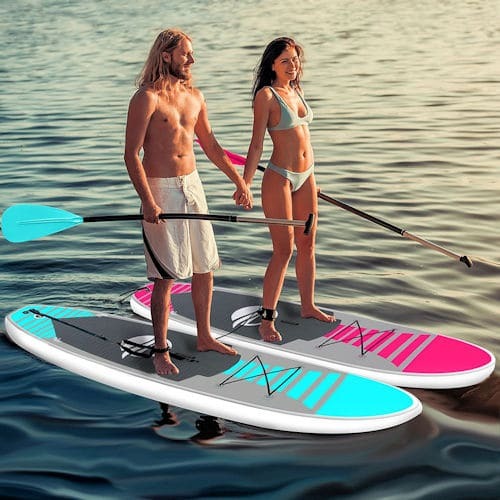 It is the kind of paddle board that helps to inspire confidence, and it will comfortably accommodate two people without sinking if you’re in the mood for fun. SereneLife supply a backpack to make transporting the paddle board easier. The addition of a bag is nice, but the straps are close together which may be a problem for people with wide frames. So, in conclusion, who is this paddle board targeting? Despite the premium label, SereneLife is going after the casual paddle boarding market. This board is all about easy-going fun and making it as easy as possible to get out on open water. Swonder knows that the majority of people in the paddle board market are looking for a product that allows them to either stand or kneel and is easier to control than a surfboard. That’s why the company claims that it’s Premium SUP offers “incomparable stability:” it wants to convince you that you’re going to have fun and won’t constantly tumble into the water. Swonder puts its money where it’s mouth is offering a 30-day return guarantee. If you’re not happy with the Swonder, you can return it for a 100 per cent refund, no questions asked. The return policy will no doubt appeal to people who are worried about the risk of the paddle board ripping if it scrapes a sharp rock. Speaking of which, is there a risk that the paddle board could suffer catastrophic failure? Unlikely. After extensive use, we’ve seen no reliability problems with this board. The outer hull of the board is made from an eight-layer composite. The inner layer is an airtight shell and surrounded by successive PVC and reinforcing layers. It’s possible to rip the PVC and still maintain the airtight chamber within. Are there any downsides? Again, not really. Swonder has done an excellent job of creating a product designed to make it easy to enjoy open water. If there are any quibbles, it’s that the pump is a little underpowered. We would have liked to see Swonder provide customers with something a little more heavy duty. The company claims that inflation only takes 10 minutes, but ten minutes of constant pumping is a proper workout, not to mention boring. Then there’s the size of the rucksack. Swonder’s product is foldable, but even when folded up in a bag, it is large. The Swonder, therefore, is for people who want to get out and have fun on open water. It’s just a shame inflation is such a hassle. INCOMPARABLE STABILITY & LARGE CAPACITY BOARD: When fully inflated, the board is 10'6"/11'6" long 32'' wide and 6'' thick, which makes it extremely stable on the water. Combined with the Non-slip soft deck, elastic bungee design, and a heavy-weight capacity, you can do whatever you want on the board! Some activities include water touring, water fitness, fishing and etc. EXTREMELY DURABLE & RIGID: Our board is constructed with military-grade PVC with a drop-stitch system, resulting in a very durable product. When fully inflated to the recommended 12-15 PSI, the unique drop-stitch technology allows the air pressure to distribute evenly across the top and bottom surfaces, forming a stable deck. Our iSUP is firmer than most of the others in the market, so you can use it for a longer time without replacing a new one. 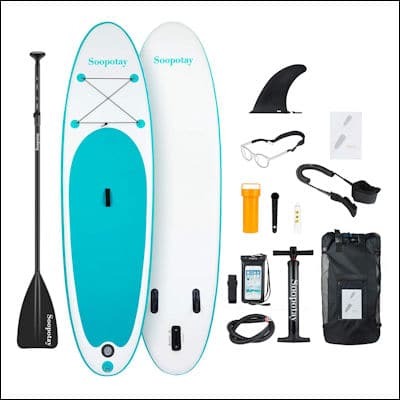 EASY STORAGE AND TRANSPORTATION: The paddleboard comes with a high-capacity backpack, which can pack the whole set and weighs only 30 lbs., Experience the convenience you will feel traveling with the Swonder iSUP set without worrying about storage. After wholly deflated, the board can be rolled up to a compact size with a cinch strap, allowing it to be stored in a car trunk, wardrobe, boat locker or under a bed! HIGH-QUALITY FULL RANGE OF ACCESSORIES: Our iSUP set includes a super light-weight aluminum alloy paddle, GRI high-pressure hand pump, 10' coil safety leash and a GRI detachable central fin. That means you won't have to hunt down extra accessories, and that you can hit the water right away! All accessories provided are of high quality and specially designed to match the color combination of the board, making them not only useful but stylish as well. 30 DAY RETURN GUARANTEE + 1 YEAR WARRANTY: Enjoy one of the most popular water sports in the world with Swonder. We stand behind our products 100%, offering only the highest quality inflatable paddle boards constructed of the highest quality materials. Feel safe in your purchase with a 1-Year Warranty for the board as well as a no-hassle 30-day free return. If you have any questions, contact our friendly customer support staff! Soopotay wanted to create a paddleboard targeted explicitly at beginners. The paddle board is 2 inches wider than a standard paddle board which adds to stability and makes it easier to get on and off and do tricks. The Sootpotay comes with a front bungee, slide-in fins that you can remove, and a center handle to make transportation easier. And weighing in at 18 lbs, it is lighter than many of the other paddle boards that we’ve seen in this review. Despite the slightly lower cost of the Soopotay SUP, the material feels very sturdy. When you ride on the paddle board, you know that you’re atop something inflated, but it doesn’t feel like this at all. The three fins at the bottom provide excellent tracking, even in choppy waters. And the underfoot-feel doesn’t feel mushy or squishy, inspiring confidence and giving you more control. Soopotay says that their SUP should be inflated to around 10 to 15 PSI, depending on user preference. But rather than let customers guess how much pressure is in their paddle board, the company supplies a pump with an on-board pressure sensor. Thanks to its excellent pump, low cost, and durable design, the Soopotay is one of the best inflatable SUPs on the market. In addition to their premium model, SereneLife also does a slightly less expensive standard version of their product. In truth, the differences between the two are minimal. Both come with tie-down bungee cords, both have a wide design, and both are ideal for all skill levels. The main difference is in the way the boards are constructed, with the premium version offering slightly better scrape and puncture resistance. Just like the SereneLife Premium SUP, the standard version offers a host of features. The 6-inch thick board means that it can comfortably accommodate two people. And the two-way pump makes inflation easier. There’s a leash that comes with the board, and the dual fins make it an excellent board for surfing. However, just like many of the other products in this list, getting from 10 to 15 PSI with the supplied pump is next to impossible for many people. Operating the pump requires a significant amount of upper body strength. 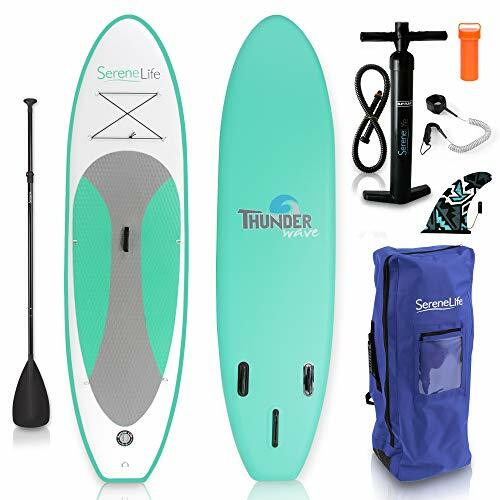 The SereneLife, however, is easy to fold up and store, making it an excellent accessory for people who want a simple and convenient way to take their paddle board to and from their cars and homes. 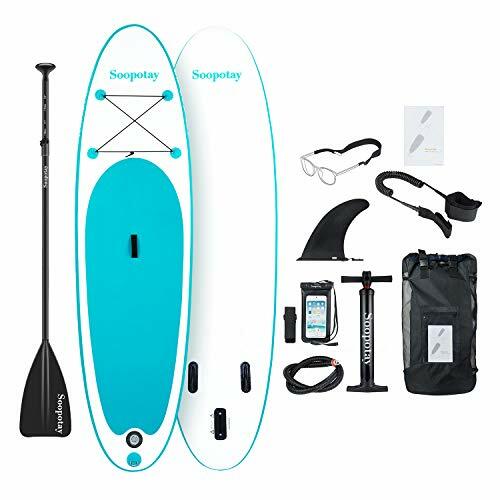 COMPLETE PADDLEBOARD KIT - Every SereneLife Paddle Board also comes with paddling essentials, including a coiled ankle cuff safety leash, oar Pedal, manual air pump, patch repair accessory kit, and convenient storage bag!